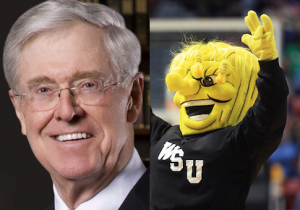 The New Yorker welcomed the start of the world's finest tournament this year by penning 1,500 words suggesting the reason Charles Koch helps fund the Wichita State Shockers as part of a plan to "control" his home-town university. Wichita State's program is one of the best stories in college basketball—in the past four years it went from relatively unknown to a team that has made the big dance and won a game for three consecutive years and is one of the top seeds this season. The program has been embraced by the Wichita community and now boasts average attendance figures that rival the country's biggest programs. Charles Koch lives in Wichita and is a known basketball fan. He, like hundreds of wealthy college sports fans across the country, acts as a "booster," the lifeblood of college sports programs across the country. The University of Arkansas, for example, funds its athletics entirely through the Razorback Foundation, a nonprofit backed by donations from wealthy fans in the community. It funds scholarships and facilities that allow student athletes to live out their athletic dreams, and every dollar increases the likelihood of seeing the Razorbacks compete on the national stage, which is why the fans donate. This is also likely the reason Charles Koch donates to Wichita State's Shockers, though that's not the situation portrayed by the New Yorker, which suggests a sinister goal of buying influence on campus through support of the basketball team. The argument's presence in the New Yorker is not a surprise. Jane Mayer, who wrote a book on the Kochs, suggested in a 2010 piece for the magazine that even the millions they donated to fund things such as the Sloan-Kettering Cancer Center are for political reasons. "The Kochs give hundreds of millions to cancer research, Mayer explains, so they can get on the National Cancer Advisory Board," the Weekly Standard wrote in a piece on Mayer's Koch obsession. "They want to get on the advisory board so that they can influence the NIH." It was this type of absurdity that led a group of protesters to take to the streets to protest the opening of a new hospital care center because it was funded by a $100 million donation from David Koch. The Wichita State Shockers are playing their first round matchup against the Marshall Thundering Herd as I write this. It is unclear what a victory will mean for the Koch's political agenda.